Arrive at New Tokyo International Airport (Narita Airport). You are welcomed and transferred by airport limousine bus to your hotel. Note: If driveway up to Mt.Fuji’s 5th station is closed in winter due to heavy snow, a tour of Fujiyama Museum would be provided instead. This morning make your way to Hamamatsucho Bus Terminal for your excursion to Tsukiji Market. The largest marketplace in Japan, Tsukiji is busy and bustling even before the sun comes up. You will stop by at several places at the market. After the visit to the Tsukji Fish market, you will be escorted to the sushi restaurant. Here, try your hand at sushi-making using seasonal seafood ingredients. This fun workshop is led by a sushi chef. Afternoon transfer to Tokyo Station and depart for Kyoto by bullet train. On arrival in Kyoto you will be met and transferred to your hotel. This morning join a local food instructor for a hands-on cooking class to learn the methods of cooking and preparing a traditional Japanese bento box. Afternoon enjoy your tour of Kyoto, visiting the Golden Pavilion, Nijo Castle and Kyoto Imperial Palace. After breakfast, make your own way to the SIC tour pick-up spot & proceed for the tour. Visit Tenryu-ji Temple, Sagano Bamboo Grove, Jojakko-ji Temple, Togetsu-kyo Bridge. Tour ends at Kyoto station, return to your hotel on your own. In the afternoon, enjoy a lesson on how to wear a Kimono. After breakfast & check-out, transfer to the SIC tour pick-up spot on your own & proceed tour. Visit Gekkeikan Okura Sake Museum and Fushimi Inari Taisha Shrine. Your tour ends at Kyoto station, return to your hotel & take your luggage on your own. Transfer to Osaka by local train. After hotel check in, the rest of day is at your leisure. Transfers in Kyoto and Osaka to and from the train station are on own expense. ** Please note that Fushimi Inari and Sake Tasting tour is not available every day. We will arrange Kyoto Back street guided Cycling tour if above tour is not available on the requested date. After breakfast, make your way to the SIC tour pick-up spot on your own. 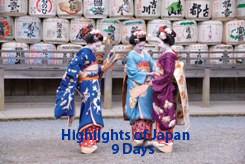 Tour includes a visit to Osaka Castle, viewing the Cherry blossom in the park and Aqua Liner Cruising. Tour ends at Osaka station, return to your hotel on your own. ** Osaka Walking tour does not depart daily. We need to check the operational status once you choose the travel dates. After breakfast & check-out, transfer to the airport by limousine bus. Jul 14 to 16, Aug 10 to 15, Oct 15/16/22/23, Oct 6 to 8, Nov 16 to 30 & Dec 1 to 9 & Dec 22 to 31. Blackout period during Rugby World Cup 2019 (Sep 04 till Nov 04, 2019). Please call for the revised quote during this period. 8 nights accommodation at hotels mentioned.